There’s nothing like sinking your teeth into tender, slow cooker pork chops that have been infused with rich flavor. Especially when that flavor is a sweet and spicy barbecue sauce. I’ve shared many a pork chops recipe, but to spice things up (see what I did there? ), I made a barbecue sauce recipe with a little heat that turned out quite scrumptious. If like me, you’re on the lookout for easy delicious recipes that take the pressure off of crazy days, then this bbq dish is for you. You’ll find a printable recipe card and fun video below, but basically, here’s the process for this recipe: Add seasoned pork chops to an oiled skillet (this step can be skipped but it adds so much flavor) on med-high heat. Sear for about 2-3 minutes on each side or until golden brown. Add meat to the slow cooker. In a large bowl, stir together ingredients for barbecue sauce and pour over pork chops. Cover and cook on low for 4 hours! You are done. (optional) Add seasoned pork chops to an oiled skillet on med-high. Cook for about 2-3 minutes on each side or until golden brown. Add meat to the slow cooker. In a large bowl, stir barbecue sauce ingredients. Pour BBQ sauce over pork chops. Cover and cook on low for 4 hours! Like I mentioned, searing the meat quickly on the outside with golden brownness caramelizes the surfaces of the meat, which enhances the pork chops with an incredible depth of flavor. It also gives the meat a more appetizing color. I made a video with some visual eye candy just for you! I have a hard time finding the Sweet & Spicy Sweet Baby Ray’s BBQ Sauce AND the Moore’s BBQ Sauce brands that we like the best. Of course, Amazon typically has both online! This slow cooker pork chops recipe has been an easy go-to fast recipe for me when I’m in a pitch. I hope it brings joy to your home like it does mine. Let me hear from you in the comments – don’t you love slow cooker pork chops?! Can’t go wrong when cooking in the slow cooker! Wow these sound SO good. I love how simple they are, and I definitely want to give them a try. I’ll need to add it to my menu for next week- YUM! Your recipes always make my mouth water (and send me scrounging through our kitchen) and this one is no exception! I love anything with the slow cooker because I rarely mess it up! 😉 can’t wait to try these! You are SO kind, Katherine! Made my day. Believe it or not I’ve had a few flops when it comes to slow cookers but this one is a no-brainer for sure! Shan, you had me at slow cooker!! My husband will love the spicy kick too! I may have to tone it down a bit for myself, still working my way up to heat, but I’m getting there, slowly but surely! I have some pork chops in my freezer that are begging for this barbecue treatment! Thanks for the motivation and the recipe! Easy meals like this are a lifesaver! YUM! I’m going to have to try this recipe. Thanks! Oh, yum! This sounds sososo good! I should get that souce and I am ready to grill! i am the only one in my family who adds BBQ sauce when eating pork or beef! But i just can’t help it! I will share this post with them so we can have it at home one of these days. That meat looks so juicy and delicious! This is exactly how I like my pork chops. I always enjoy a good slow cooker meal. With my oldest starting kindergarten this year (so longer school days) it’s nice to be able to have dinner ready when he gets home. Both of my boys will eat pork chops, so I’ll have to try this soon! I love tender juicy pork chops. I hate biting into dry, really tough ones! The BBQ sauce is a nice bonus. oh my gosh, that is so mouthwatering. I am so hungry right now just by looking at the photo. Might try this someday. Ok that is a meal I could definitely enjoy! 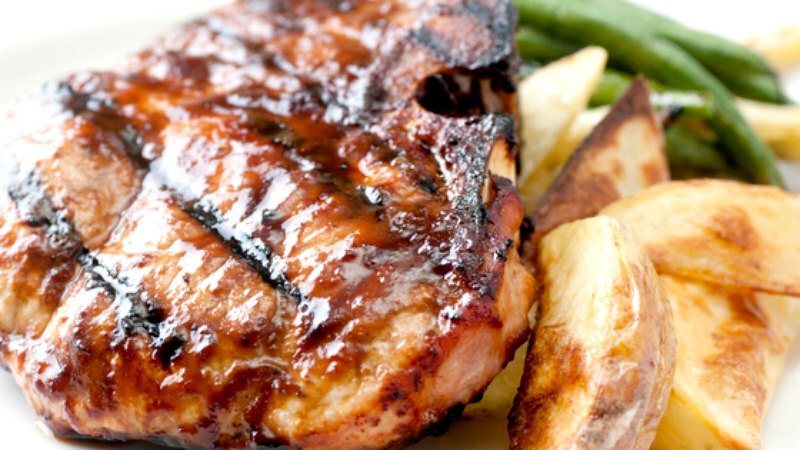 Love how you BBQ pork chops turned out, look delicious! They look gorgeous and so delicious! Slow cooking is the best way to have a tasty and healthy meal. It’s dinner time now and I think I am so hungry after all these photos! I love BBQ! This looks amazing and really yummy. A great way to have BBQ in the months that it’s not exactly grilling season. Reading your posts are so dangerous they make me so hungry ! I look forward to making this recipe. Oh my goodness, I HAVE to try this!!! 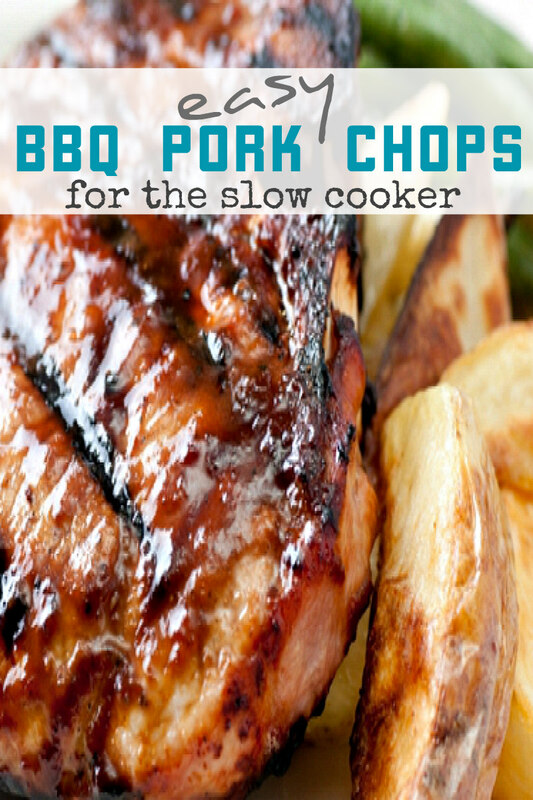 My hubby loves BBQ but always looks down his nose at my slow-cooker meals (he finds them “flavorless”), and we all LOVE pork chops, so this sounds like a win-win! It is hard to infuse that flavor in the slow cooker sometimes but I hope you knock his socks off with this one, Flossie! 😉 Let me know! This recipe looks easy enough! I bet my Dad would love it. I usually make him a pork roast in my slow cooker and we shred it for sandwiches. Will have to try this next time. Shredding it for sandwiches sounds awesome! Let me know how it goes when you make it! Trying Your recipe today…They look and sound Delicious !! !